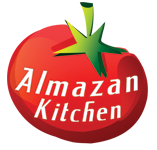 AlmazanKitchen Hot Dog Rush continuous. Today Boki caught dangerous rare Serbian wild sausage snake and that was an idea for the giant hot-dog in a primitive forest style! Extraordinary sausages rolled into melted tilsiter cheese with greens, and hot chilies! Everything is served inside special fresh Serbian baguette. Delicious! Real art of ASMR cooking and Foodporn! Chop leek, red and green chili and handful of parsley. Slice homemade giant sausage into medium parts. Skewer it up on a stick. Grill for 7-10 min on 518 F/270 C.
Preheat special clayware cooking plate and grease it with oil. Slice as many cheese squares for each sausage. Melt the cheese, add greens. Roll each sausage in the cheese square with greens. Crispy Steak Rolls! – Magical CookingBest & Most Epic BBQ Wings You Will Ever See!